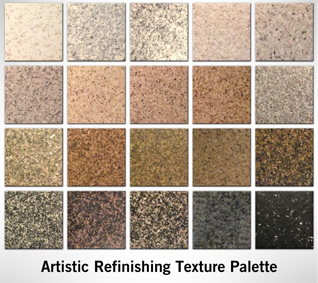 Artistic Refinishing is an amazing process that will not only give your fixture new life, but it will extend it too. The durability of this new coating provides for long term – extended uses! It is popular among contractors, homeowners, and tenants, because it will let them easily remodel a place without buying new tile or furniture. The refinishing process does not take long to do at all, some projects can even be done in a matter of hours, and the results are unmatched. An Artistic Refinished project can easily last 10 to 15 years with proper care and maintenance by the owner(s). It is not uncommon to hear of a refinished piece lasting well over 15 years in its prime state. That’s right, if you just refinish your fixture, it will give you unparalleled extension to its life! If you are still on the edge about getting something refinished, just know, it is not only cheaper than buying a brand new piece, but it will last just as long – if not longer. The bonding process used is like none other. The new finish becomes a permanent part of the fixture through a new bonding process. This also means that nothing will be trapped under the coating, which can cause problems. If not done correctly, with the older methods of bonding, water could get trapped under the finish, causing damage. With this new bonding process, the new fixture becomes one with the old finish, leaving no room for anything to get stuck or trapped behind its surface. Refinishing is the best way to go with every option or variation you could think of. You get to keep your tile, bathtub, etc. and just have it spruced – giving it another 10-15 years of life! Next Next post: Variety with refinishing!